Over 90 percent of the students at D.C.’s Thurgood Marshall Academy live in the city’s two poorest neighborhoods. Every graduate since 2005 has been accepted to college. “Coats off, scarves off, hats off! Belts on; shirts tucked,” Stacey Stewart, Thurgood Marshall Academy’s director of student affairs, yells at the two lines of students waiting to check in and begin the school day. 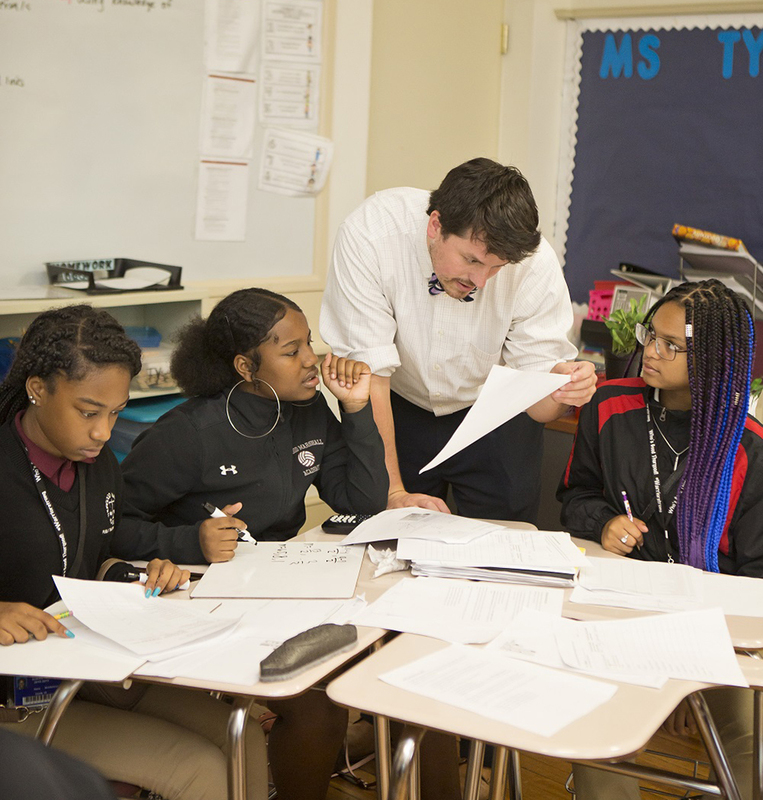 Consistently ranked as a top-tier public charter school in Washington, D.C., Thurgood Marshall Academy is a law-themed school that serves about 400 students in ninth through 12th grades. Over 90 percent of students live in Wards 7 and 8, the city’s two poorest neighborhoods. Nearly 100 percent are African-American, and 61 percent are designated “at risk” by the Office of the State Superintendent, meaning they are at greater risk of dropping out based on their receipt of public assistance, food stamps, involvement with the D.C. Child and Family Services Agency, homeless status, or being older than expected for their grade. The average ninth-grader enters TMA three to four years behind grade level. Nevertheless, since TMA graduated its first class in 2005, 100 percent of graduates have been accepted into college, over 90 percent have enrolled in college within a year of graduating from high school, and 94 percent persist in college from freshman to sophomore year. The school’s cohort four-year graduation rate (a city calculation that also includes the status of students who have withdrawn or moved to different schools over the past four years) is 78.5 percent, higher than the statewide average of 68.5 percent, and significantly higher than the neighborhood’s district-run high schools, which have rates of 50 and 55 percent. For the past three years, student scores on D.C.’s standardized exams have been among the highest citywide for nonselective high schools. They’re exposing students to law-infused curriculum. They’re increasing learning by supporting students and teachers. And, they’re not giving Ds. The grading scale at TMA goes A, B, C, F.
TMA’s goal is not for every student to become a lawyer but for all students to gain competency in the skills that lawyers rely on. The “five essential legal skills” — advocacy, argumentation, critical thinking, negotiation, and research — are woven into the curriculum for all classes. Each year in history class, students must complete a law-related project that emphasizes the five legal skills. Previous projects include mock trials, soapbox speeches, issue-to-action projects, and studies of the impact of federal legislation on D.C. Council legislation. In the 2017-18 school year, the social studies department arranged 18 educational trips for students, including a visit to the U.S. Supreme Court. Students also participate in the school’s law-related programming. In ninth grade, students have Law Day six times a year, when they attend legal workshops hosted at and by local law firms. Sophomores spend eight half-days at Howard University, learning from professors about how law is present in their everyday lives. During their junior year, students get to know a legal professional through the Law Firm Tutoring mentorship program. TMA partners each junior with a mentor at a local firm. Once a week, students travel to the firm (which provides meals and transportation) and have dinner with their mentor, who helps them with scholarship writing, SAT prep, college research, etc. “Understanding the law and my rights has made me a better person outside of school,” says Devin Halliburton, a junior at TMA, whose Law Firm Tutoring mentor Yasmine Harik is an associate at Arnold & Porter. For those students who become interested in pursuing a law career, TMA offers more in-depth law courses. For instance, in Peer Court, students learn about how laws affect school policy, such as the Individuals with Disabilities Act and special education, and court cases, such as Morse v. Frederick, involving students’ free speech. In the 2007 case, the U.S. Supreme Court found a school official had not violated a student’s First Amendment rights by suspending him for displaying a banner proclaiming “Bong Hits 4 Jesus.” Another component of the class involves volunteering on a student-run court, which coordinates with the Office of Student Affairs to assign and monitor consequences for students who have committed minor disciplinary infractions. “What’s the hottest place in a cold room?” Kamani asks. “The corner, because it’s always 90 degrees.” The class laughs, but no one louder than Kamani. Ms. Odu laughs with them. The school’s leadership believes that too often in urban education, teachers are asked to perform multiple roles beyond teaching, making it impossible for them to focus on improving their craft and, by extension, student learning. At TMA, deans are in charge of managing school culture and student behavior while the heads of school focus on instructional delivery. Instructional leaders are made aware of behavioral issues, but the deans are responsible for handling those issues. Stacey Stewart, the director of student affairs, believes that this division helps assuage behavioral problems. “A lot of our kids have a lot of stuff going on at home, and their behavior is not always a reflection of what’s going on in the classroom,” she says. When behavioral issues do occur, TMA differentiates consequences based on both the seriousness of the infraction and the student. Peer Court assigns consequences for violations of TMA’s “no-brainers” — chewing gum, using devices in school, uniform violations, etc. — while Stewart’s office handles higher-level violations, such as fighting and willful disobedience. But TMA’s leadership also expects students to own their behavior. The school uses a merit and demerit system. While students can work off demerits by gaining merits, if, at the end of the year, a student has more than 20 demerits, he or she won’t be promoted, regardless of academic performance. However, because grade-level deans host opportunities for students to earn merits over the summer, like classes focused on community service for the school or building positive relationships, this rarely happens. For the past three years, no student has been held back because of behavioral infractions. Students also reflect upon their yearly progress through a portfolio assessment. Each spring, they give a formal presentation to three faculty members during which students examine their academic performance as well as their behavioral record and overall contribution to the school. And they turn in a portfolio of the materials they intend to speak about. Halliburton’s reaction is exactly why TMA grades on an A, B, C, F scale, where anything less than a 70 is an F. The school’s leadership believes that if students don’t know at least 70 percent of the material, they won’t be prepared to pass at the next level. The lack of Ds is not a punishment; it’s a success strategy. Students are eligible to take up to two courses per summer if they fail their courses. If students do not retake a failed course over summer, they either receive an alternative schedule for the following year, which includes the retake, or they retake the course in a subsequent summer. However, for courses that have a specified order, as in Mills’s case, students must pass the prerequisite before moving on to the next level. Since most ninth-graders enter TMA below grade level, freshman and sophomores take double-block English and math classes. They have twice as much classroom instruction as their peers at traditional high school programs. These double-blocks are a cornerstone of TMA’s success at raising student achievement. 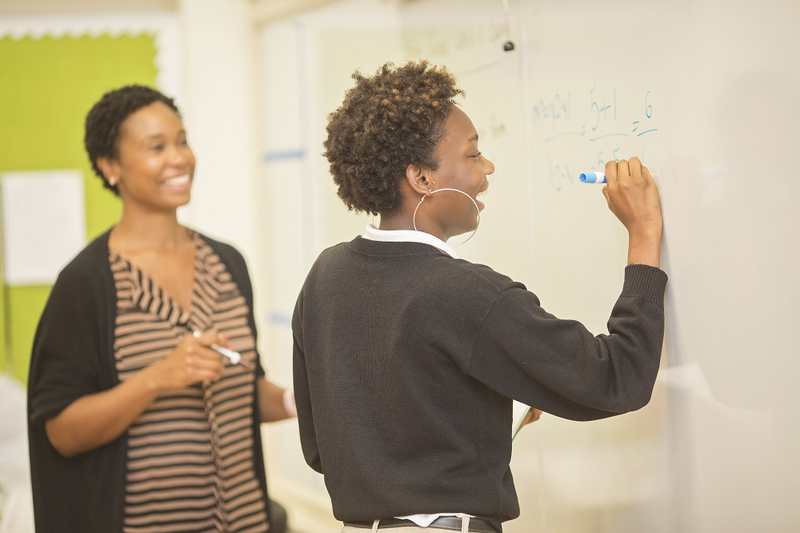 Other academic supports include a Summer Prep program that helps students transition into TMA’s rigorous academic environment, an SAT prep class, and a Senior Seminar in which students receive intensive coaching on the college application process, help with scholarships, and lessons on transitioning to college life. The school has a robust college counseling department, with three full-time college counselors. One national study that looked at 911 two- and four-year colleges found that 96 percent of students there were placed in remedial classes in 2014-15. Remedial classes carry no credits, but enrolled students who cannot pass freshman-level course entrance exams must complete and pay for them before they can enter into credit-bearing courses. Research has shown that a large percentage of students placed into remedial courses drop out before graduating college, and often before even finishing the course. Both Halliburton and Mills agree that “Thurgood is hard,” but, by the second year, students adjust to the rigor. Moreover, they regard the high standards as the manifestation of the faculty’s belief in their abilities. It’s this combination of rigor and support that draws many parents and students to TMA. The school’s success with students, as well as the demands placed on them, are well known in the community.